If you’ve lost a few teeth and have been considering dentures as a replacement you may be wondering what options there are for people who still have some of their teeth and need a way to fill in the gaps. This is the realm of partial dentures, and they’re a great way to bridge the gap between a few missing teeth and a full set of dental implants. When Would Partial Dentures Be Appropriate For Me? While eating your favorite foods can be difficult with a few missing teeth, and gaps in your smile can be unsightly, missing teeth are more than just inconvenient or unsightly. Your teeth do not exist in a vacuum, neighboring teeth provide structure and stability for your jaw and each other. The pressure placed on your teeth through daily use can change their placement, increase the wear they experience, and allow tissues and bone where teeth are missing to shrink. Partial dentures provide the support and stimulation that will help keep your whole mouth healthy and restore a beautiful smile. 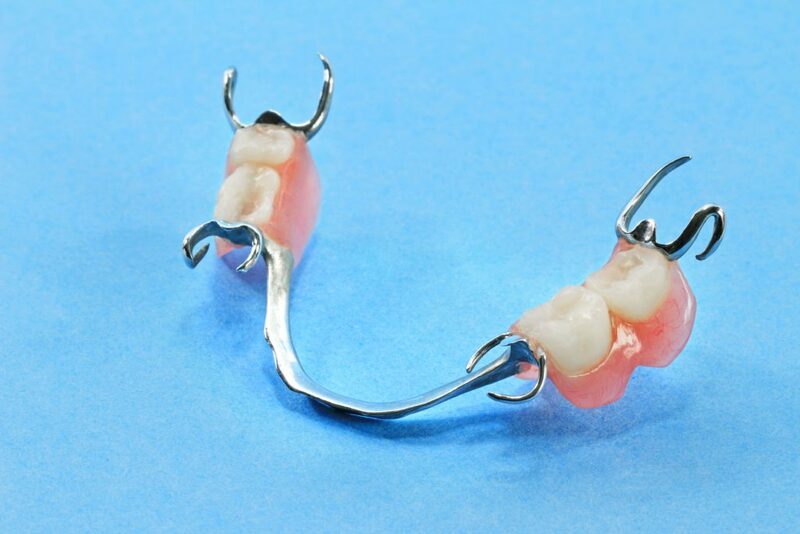 Partial dentures are an option that tends to be less expensive than other methods of replacing missing teeth and are certainly less expensive than a full denture would be. To maintain their appearance and functionality they do require a bit of care though, so your oral health routine will include a couple of extra steps to help preserve this prosthetic. They also save money down the road by helping maintain the health and appearance of your remaining teeth. Can I Sleep With My Partial Dentures In? It is far healthier and safer to not sleep with your partial dentures in, and it’s also better for the denture itself. Partial dentures are not intended to be worn constantly but need to be taken out and cleaned regularly to ensure both the denture and your mouth is free from food particles and decay. While your gums benefit from wearing partial dentures, they do need a break from the pressure they place on them. Some patients also grind their teeth in their sleep, which can lead to additional wear and tear, chipping, and even breaking of the partial itself over time. Are There Foods I Should Avoid With Partial Dentures? For the most part, your partials will restore the ability to eat all of your favorite things naturally, but during the first few weeks of owning them, you’ll likely want to stick to softer foods to give your teeth and gums a chance to adapt to the presence of the partial. It is best in the long run to avoid foods that are particularly hard or sticky to ensure you don’t damage the partial denture. If you think a partial denture may be right for you it’s time to pick up the phone and call Duc Pham at Premier Dental of South Orange County in Aliso Viejo, CA. Partial dentures are a great way to restore a beautiful smile, preserve the health of your gums and remaining teeth, and enjoy all your favorite foods without implants! Next Post: Why Do I Need Whitening?